I'm pushing on to run my Selenium tests. I have a web site to test and a selenium test project with the tests. I build and deploy the test site locally. I then run the selenium tests under mstest. The good part is that the tests run and report correctly. The problem is that the build fails. As the tests run I get a lot of 'noise' in the console and this includes some errors from Selenium (I googled and they appear to be known bugs). These don't cause the tests to fail however they're being flagged in red in the console and I assume they are what is causing the build to fail (it passes without the tests being run). Is there some way to prevent these errors failing the build (and ideally suppress the noise). I've tried to disable that logging for FireFox at no avail. I suspect those messages come directly from FireFox to StdOut. Though Chrome driver seems working the best. Regarding "they're being flagged in red in the console" - could you please drop a screenshot of console to see how it looks like? I see. Do you call vstest.console command as part of your build script, not using tests "autodiscovery"? Yes because I want to run the tests after deployment. Perfect! 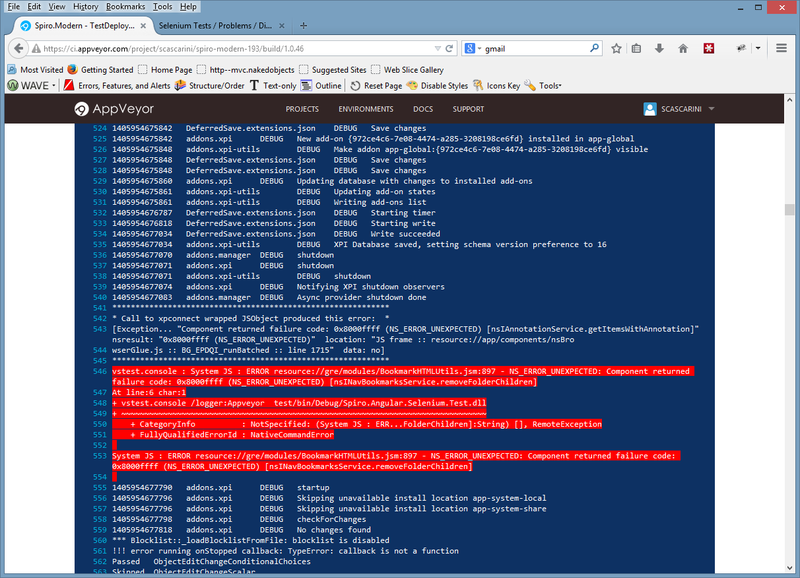 The problem is that PowerShell treats everything written to StdErr as exceptions. Switch "after deploy" script to "CMD" mode - that should fix a problem. OK tweaked that and kicked off a new build. All looking good so far - tests are running and console is clear. So the tests run as 'CMD' but run very slowly. About 5 ran in 30 minutes and then the build timed out. Based on your comments above I did some experimenting and found that if I set the /InIsolation flag I could switch back to running under Powershell and I don't see any errors in the console. as Powershell and it runs about 50 selenium tests in 15 minutes or so. Wow, that's really interesting observation! I will try to understand this difference between PS and external command mode. Any updates on the issue? Why there is a time difference ? We are also suffering from slow acceptance tests. I believe it's been fixed for the new environment. Look at that: https://ci.appveyor.com/project/FeodorFitsner/selenium-tests/build/... - ran basic Selenium test against FF, Chrome and IE (!) drivers in just 47 seconds. Artifacts contain screenshots.